You have all heard the news. The 800-year old Grand Al-Nuri Mosque whence the Caliph of Cockadoodledoo announced his ascension to the throne of his imaginary Islamic asteroid has been deliberately destroyed by either the Islamist nihilists of ISIS or the boneheaded nihilists of the American-led coalition. We don’t know, yet. However, the Pentagon, as always, denies anything that smacks of American war crimes or unsavory activity. If you believe the Pentagon, only a few hundred Iraqi and Syrian civilians have been killed by its air strikes when almost all groups monitoring the carnage attest that the U.S. has killed over 5,000 non-combatants. Like the Leaning Tower of Pisa in Italy, this particular mosque has gained popularity because of the minaret’s attitude; it leans about 9 feet away from its idealized vertical position. It might be of interest to some of you that the mosque was ordered built by the 12th Century Seljuq Atabegh of Mosul, Nooreddeen Al-Zangi, whose name has been borrowed by the head-slicing savages who were annihilated by the Syrian Army in Aleppo recently. While they remain active as terrorists allied with Ankara, they have found little peace or success in recent months. I have already told you that Al-Baghdaadi was killed by the Syrian Air Force 2 years ago near Mayaadeen. His death has been kept a secret in the same manner as that of Mullah ‘Umar of the Taliban. Iraqi officers leading the ISIS security services feared a mass desertion if the death was announced. There was also a fear that his death would be viewed by some as proof of his human failings and disapproval by the deity himself. Pure nonsense? It is, but, so is the entire militant Islamist experiment. Russia is announcing is own responsibility for the death of the freak Caliph because ISIS terrorist channels are discussing how to announce his demise. The Russians, for good reason, interpreted the chatter as proof of their success in killing the master rodent only because it coincided with their own bombing runs over Al-Raqqa. QUNAYTRA: There is no better proof that the Zionist Settler State is awash in war crimes and violations of international law than its support for Alqaeda, in the former disguise of Jabhat Al-Nusra, n/k/a Hay`at Tahreer Al-Shaam. Yesterday, in what appeared to be another fouled-up Zionist military operation against SAA positions near Al-Ba’ath City, the Syrian Army repelled a frontal attack by Alqaeda vultures just as Zionist helicopters fired missiles at civilian residencies killing over 25 with many in critical condition. The stinking rat Khazar Zionist cockroaches couldn’t hit the wall of a barn if they had to. As they fired at Syrian Army tanks, they were shocked, evidently, to see how effective new Russian armor was and how effective the Sarab 1 anti-rocket system was in deflecting American-made TOW rockets. The attack was a disaster. Over 17 Alqaeda rodents were killed with scores seen evacuated to noisome clinics operated by Warsaw Ghetto scum near Al-Hameediyya. The president of the republic, joined with other Muslims to celebrate the end of the Holy Month of Ramadan at the Al-Noori Mosque in the City of Hama. He was flanked by the Grand Mufti, Ahmad Badreddeen Hassoon, and the Minister of the Islamic Charities (Awqaaf). Western propaganda machines are having some kind of field day with this event because as they,wrongly, claim, the president rarely leaves Damascus. Their suggestion is that he remains cloistered in his home as the war supposedly rages on. One article in the MSM argued the president, Dr. Assad, is showing a new confidence in the way the war is evolving, hence, his unexpected visit to Hama. Al-Salamiyya: At the axis of the oil pipeline and the ruins of Al-Deeba, the Russian navy fired off 6 Kaliber cruise missiles from 2 frigates and a submarine in the Mediterranean while the Syrian Army joined in by unloading tons of ordnance on the remaining ISIS refuse infecting the Hamawi countryside. According to all sources on the ground, ISIS suffered heavy losses in rats and materiel. DER’AH: The Syrian Army has successfully sealed off the Eastern side of Der’ah from the partially-infested Western side. In doing this, the SAA has essentially isolated pockets of Saudi-and-Zio-supported terrorists and prevented them from infiltrating into the east to conduct trade or to replenish their supplies. This is the end of the terrorist occupation of Der’ah. A large SAA force from the 5th Mechanized Armored Division is preparing to launch the final offensive to exterminate the cringing rodents. DAYR EL-ZOR: Short and sweet: The SAA has finally crossed the Euphrates River and entered the Eastern side of DZ. ISIS defenses are collapsing as news from Mosul continues to arrive indicating a major military catastrophe there along with leaked news of the “Caliph’s” demise. Q. Let us start with an essential point: your visit to Hama in June 2011. Why did you go? And do you think this was a wise decision? “Q. Was that a wise decision? “A. There are two aspects: one positive and one negative aspect. My visit showed the Syrians that we’re interested in Human Rights issues. I still meet Syrian people now who tell me: Thank you for visiting Hama… But there are also two negative points concerning my visit: First, the Syrian government used the visit to support its propaganda on the Syrian revolution being an external conspiracy. Second, one student of mine at Yale is writing a thesis about this: my visit and other actions in Syria in 2011 encouraged the growth of the protest movement. However, the Americans were not willing to dispatch the army to help the Syrians. This means that we gave the Syrians a fake hope. “…Q. 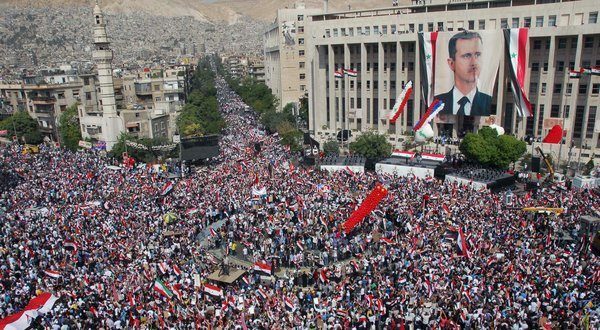 After six years, did you expect that Al-Assad will still be in power despite all that happened in the country? “A. In late 2013, I thought the attrition war will be harsh on the regime and that they will be negotiating a deal. Some will ask for a pardon and leave to Algeria or Russia or Cuba. [I thought] that a coalition cabinet will be formed…and because the Syrian army will be weak, the regime will accept to save itself in return of giving up on the Al-Assad and Makhlouf families. “Q. Did you really think that the regime will be negotiating its end? “Q. Why has Washington failed to modify the state of stagnation? “A. Al-Assad won. He’s a victor or so he thinks. Maybe in ten years, he will take the whole country. The regime won’t be held accountable for the chemical weapons, the killings, the torture, the explosive barrels, the refugees and the displaced people. No accountability. Al-Assad might be visiting Paris or London, but no one will visit Damascus to take the regime’s officials to be tried in The Hague. No one. The regime might require some time to restore Deraa. Sooner or later, it will go to Idleb. The Russians will help. It [the regime] will go to Qamishli and strike a deal with Iran and Turkey to destroy the Kurds. “Q. What about the Americans? Will they not protect the Kurds? “A. Do you think the Americans will be fighting in Qamishli? “A. Did you hear an American official say, or read an American statement indicating: we will defend West Kurdistan after ISIL’s defeat? “Q. No. What does that mean? “A. Is this a coincidence? They will not defend the Kurds against the Al-Assad forces. “Q. So they’re using the Kurds only to free Raqqa from ISIL? “Q. What is Trump’s ultimate goal? The new Moses who can part the mountains to keep the juice safe. 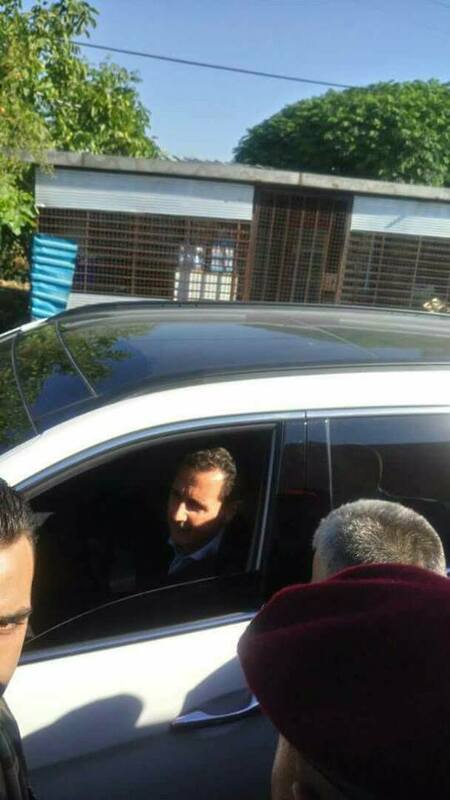 You dont believe reports of Assad driving around foreign dignitaries around Damascus himself? Question regarding the SAA advance to the east of Dayr El-Zor. Were these SAA units arriving from the north west from the Russaiah sector or from the western Palmyra sector? Either way the siege should soon be lifted as the IS et al front seems to be collapsing on a total basis. While nice to hear, all eyes watching what in fact happens on the ground – meaning no US interference with Syrian ops. We shall see. Mike. Dont know if anyone is following this 4th prong attack… Lots of in pocket Experts with no credentials other than online degrees and expertise have come out of the woodwork. Gives new meaning to “be what you can be online” no experience necessary. President Putin talked about illegals intelligence.. Breaking up russia to many smaller countries by nato. The Americans are pleading for a role in the demise of IS. Reminds me of the joke about Putin explaining what it’s like to play Obama at chess. Oliver Stone Exposes US Warmongers at Writers Guild Awards. Thanks Ziad. The robert ford interview was typical forked-toungery. He starts by demonizing the legitimate government. 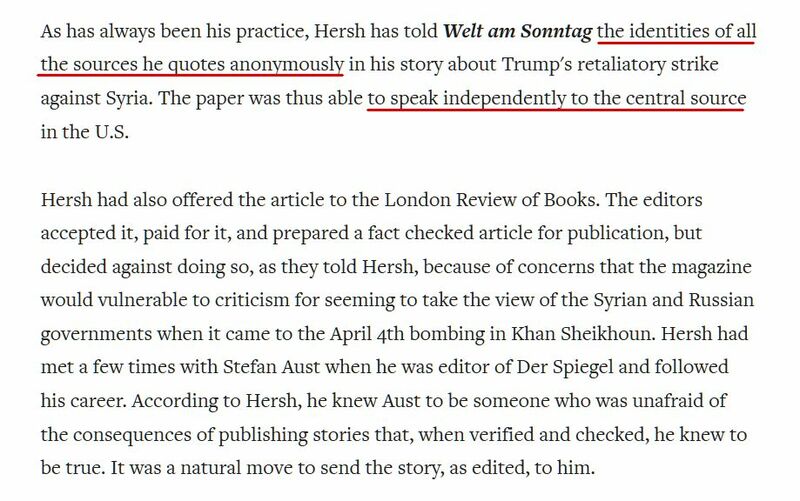 It is unbelievable how they stick to their own lies, even when the evidence that the western media is forced to admit, is overwhelming. Armenians and other Christians are fighting together with Muslims in the Syrian army to push out the vermin aided and abetted by the US/EU and its dumber than stupid proxies. We look forward to rebuilding the memorial to our 1915 martyrs in Dayr El-Zor, to the final victory of Syria over its enemies, and to a well deserved peace and rebuilding. As to the enemies of Syria may they rot in hell. The news that SAA has a bridgehead on the east side of the Euphrates at DZ has made my week! Go SAA! Get LOTS! Important event coming from Iraq. The Iraqi High Command has recently made a decision to prep the elimination of ISIS from Anbar Province. This advance will require multiple fronts but most likely will start with the battle for controlling all right banks of the Euphrates at the lake Qadisiyah and the key villages of Aanah and Rawah, then the desert area with H1 & H2 and finally al Qaim. This operation comes at the moment that the SAA and allies are about to take full control of T3-T2 road. I hope you will be able to return to a peaceful and prosperous Syria any day soon now, to visit friends, family and a beautiful country and people. Have mentioned early today about the topic of some public maps (wikimapia etc…) that these maps are biased toward increase areas held by SDF. In the past 2-3 days the SDF has made a huge PR toward encircling ISIS in Raqqa by cutting their southern exit on the right banks of the Euphrates, public maps jumped the gun and spread the news with full encirclement. 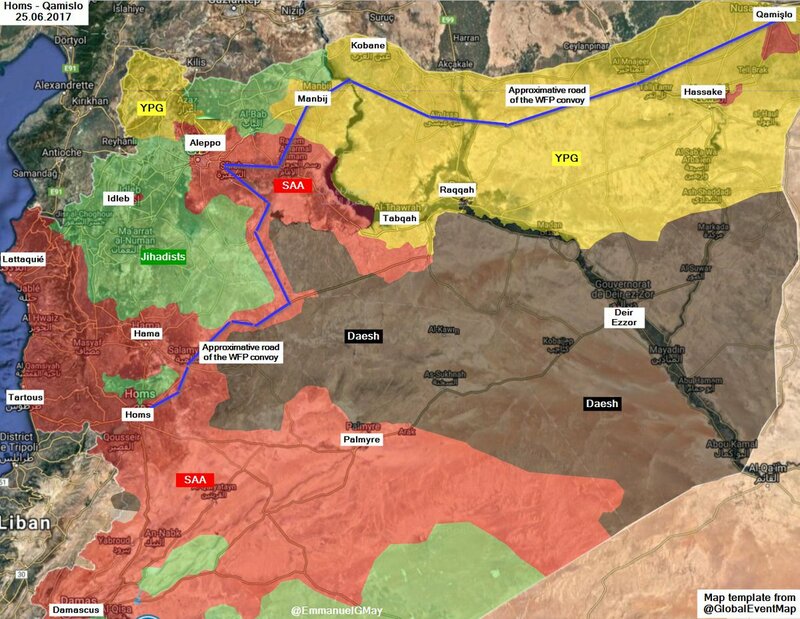 It is now proved it was all BS, large gap still exist for ISIS to retreat or send reinforcements, time will tell. This should be stealing civilization…destroying any other evidence of civilization that can refute this narrative. We never heard much about this general but he was a giant. His skills will be missed..
Turkey’s president Erdogan claims NATO cooperates with terrorists, says it’s time to review the alliance. It will rise again. The US is smart or so they think. Would lose a lot in the end. 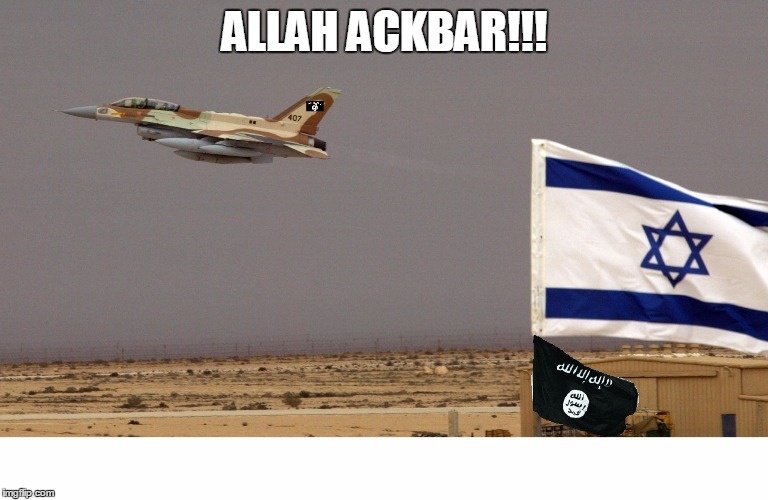 And again the pissraelis attack the SAA and right after that a terrorist group pushed an attack on the SAA, and of course once again the terrorists fail, patience has it’s rewards, and in the case of this zionis pigs that reward is going to be huge when the time comes. Eid mabarak to all the muslims. with over one million ethnic russians living in israel. one has to ask just whose side is putin on? i think o’connell has a point. The sneaky and cowardly attack of the Apartheid State on the SAA [fighting takfiri terrorists on its own territory] resulted in 2 SAA KIA. Despite the heinous act, there’s also a glimmer of hope in all this, as the Apartheid State claimed to have attacked 2 tanks and a mounted machine gun. That accounts for 2 x 3 men [tank crew] and [most likely] 2 men on the mounted machine gun. 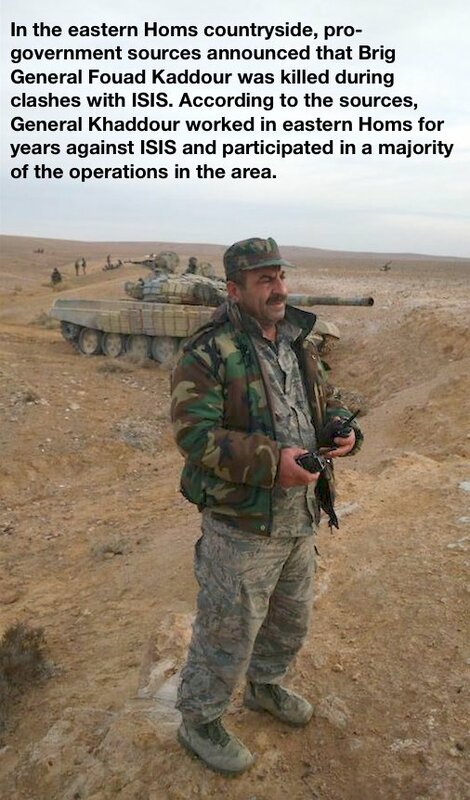 This means that [most likely] the 2 Syrian tanks’ defensive mechanisms [reactive armor] worked perfectly and saved the men’s lives. When people meet person to person, they will be able to build bridges, not burn them. In a just world, these Russian tourists will be travel onward, to Damascus. The red cross is anti Semite. The ISIS Air Force attacks SAA positions for a 3rd day in a row. Could that be because their proxies are being slaughtered by the bushel by the KLions? Druggies stick together.. Busted for possession. Syrian singer Asala who supports the “terrorists” in Syria has been busted at Beirut airport for possession of cocaine.